I know... I've been a bad, bad blogger! More than a week since my last post! So it's about time to update a little. Lat weekend I've been demonstrating at the KKD at Kars in Ochten. I had a wonderful time! I was asked to demonstrate with Prima products... well, haha, of course I said YES! I just love their products! It were 2 days of fun, laughter and a lot of talking. I was sitting between my friends Bonnette on my right and Corinne on my left and in front of Tim Holtz. Not that I saw a lot of him though... There was a constant crowd of women around his table and the fist glimps I got from him was around 3 p.m. on sunday, hehe! But hey, who can you blame. The man makes great stuff so I can imagine everybody wants to have a look at his demo. Met a lot of people I know, people I only knew from their blogs so far like Nili (so fun to meet her!) and new people!! I had a nice dinner with Corinne and Tanya on sunday evneing and a meeting with Kirsten from CmF on monday evening. So it was a busy but good weekend!! Here's one of the projects I made for the demonstration. The frame was painted white when I bought it. 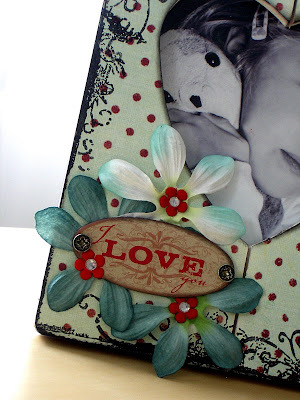 I covered it with Prima paper, then stamped around the edges and added the flowers. Everything is Prima except for the text-plate (Deja-Views) and the diamonds (Make Me). Used real screws to attache the little plate. I returned home yesterday and I was hardly in or the postman came with a box from the US! It was my price for winning OLW! 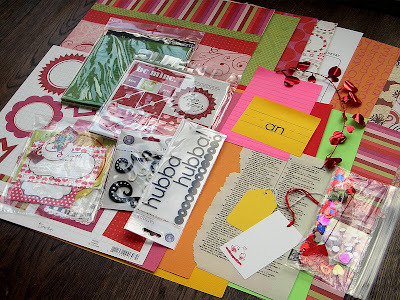 Gina from Sweet Spuds send me an awesome kit with paper, chipboard, letters and lots of fun little goodies! Can't wait to start creating with that! My mom: Oh, how fun! and Stijn? did they bring Stijn along too? Marlijn (quit annoyed): Well, yes... of course they brought Stijn!! The boy is only 4 years old! You can't leave a child like that home alone, can you!!?? Haha, she's a little smarty-pants and she crackes me up!! I have to scrap that! Not sure yet how I'm going to do that, but I will! totally love the frame. HOw cool you got to see Tim. Must have been an awesoem experience! Hai Birgit, het was leuk je weer even te zien in Ochten! Je had echt weer kei-gave dingen gemaakt!! wow mooi prijzenpakket zeg ! wat had je weer mooie dingen gemaakt zeg ! What a great frame, love it, I wish we could get more of Prima here.... it's very hard, unfortunately!!! And the price from OLW is awesome, you're going to have lots of fun with that!! The frame is stunning, so beautiful! Het frame ziet er prachtig uit. Dat moet heel gezellig zijn geweest bij Kars en super om te demonstreren met Prima produkten. Your not a bad blogger. You made a lovely frame. And wow, do I love your kit. I love Scenic Route and there's a lot of it in it. Enjoy it! Wat gaaf zeg die demo! Je frame is echt helemaal super! En je prijzenpakket is ook yummie!!!! 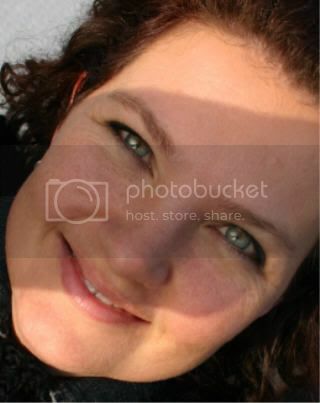 Hoi Birgit, leuk je in het echt gezien te hebben in Ochten (was er samen met Tessa) Zag thuis pas op je kaartje waar je woont. Wat een klein wereldje, ik heb ik Warffum gewoond ;-) Gave dingen had je gemaakt met de primaspullen. Vooral die paintables had je cool gebruikt. Ben bang dat ik ze nu toch ook wil gebruiken, bedankt voor de inspiratie! Oh jeetje wat mooi gedaan zeg!!! Hahaha, leuke conversatie van je dochter en wat een leuk kadertje!! Het allermooist deze keer vind ik toch de dialoog tussen Marlijn en haar Oma. BTW je frame is super, de schroefjes helemaal fab!! Tim Holtz? From now on he's in my favorites!! Leuk om daar weer een site aan toe te voegen. Woensdagmorgen horen we vast meer over hem :). That frame is sooo gorgeous! Really nice things you make! And it´s always fun to get new scrap-things! Have a nice day! 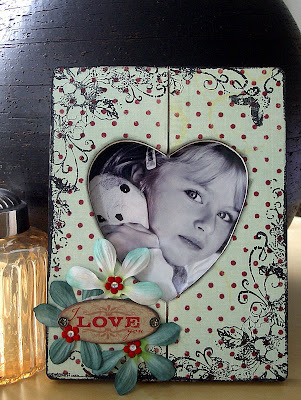 Woohoo... beautiful frame Birgit! And so cool you won the OLW-challenge! :) The prize looks amazing! Oooh, wat gaaf geworden Birgit! Super, dat frame!! WOW Birgit, what a wonderful Prima project and good to read you had a great weekend at Kars (looks like a very inspiring weekend to me). Wish you fun playing with the OLW goodies! Love love your frame!!! The price is awesome!